At R+M we start every Monday with a status meeting. We talk about our weekends, the status of each project and what we call THIRST®/Anti-THIRST moments. These moments are customer service encounters that are either awesome, or unawesome; whether that’s the plumber who not only fixed the running toilet, but also changed a light bulb just because, or some surly employee who couldn’t be bothered to answer a question. These moments make you THIRSTY or Anti-THIRSTY for a brand. And from these THIRSTY moments come referrals. We all have our favorite people, places or things, that we consider referral worthy. I have a great HVAC guy who goes above and beyond every single time. Greg has a great deck guy who’s a meticulous craftsman and a great communicator. When I asked Susan who she has referred to friends and family, she said, “I recall referring 3 businesses in my life: my realtor, my accountant and my chiropractor. Notice the ‘my.’ I think that’s key to the referral – I’ve claimed ownership of them, that’s when I know they are living their brand. 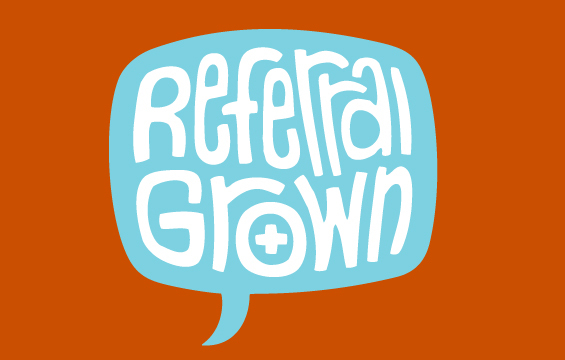 To us, a referral is the ultimate compliment, and we are driven every day to earn a referral from our clients. That drive is reflected in the fact that 80% of our growth comes from referrals. To remind ourselves of its importance, we developed an icon to say we’re proud to have served our clients so that we are Referral Grown. You’ll see it on our Work page indicating clients who have been referred to us. And you can read how it is tied to our Brand Promise on this page. We’d love to hear who you refer people to, whether that’s a great handyman, restaurant, whatever, and why you refer that person, place or thing. Let’s get a dialogue going in the Comment section below this blog. And by the way, does anyone know a great house painter? Excellent points in this post. And while I could go on and on about the positive referrals I have made (let me know if your hot tub or pool need help; I know a guy) I’m more inclined to share an anti-thirst story. A man installed a geothermal heat pump at my new home. They did a good job, but the project was only so-so over all because the installer never really took the time to fill me in each day. Imagine my surprise when he called me, months later, to ask if I would take a look at his son’s girlfriend’s resume. I wanted to say, “now why the hell would I do that?” instead, I resolved not to recommend the geothermal installer. Why? Because he clearly never got to know me. The fact that so many of your clients recommend you to others speaks volumes! Keep listening! Daniel, thanks for sharing your Anti-THIRST moment. I’m always surprised that I’m always surprised at peoples lack of understanding how they come across. I was at a Duke/Carolina game and witnessed a Carolina fan berating a concession worker at Cameron for who knows what. Moments later he came back to the same worker with ketchup and mustard all over his shirt. I didn’t hear what was said, but the worker handed the fan a towel and bottle of club soda. When I finally got to the counter I smiled at the worker to let her know, you’re the better person. She turned an Anti-, Anti-THIRST into the THIRST of all THIRSTS. I tell that story all the time. Thanks again for your comment, Daniel. And the day I need a pool guy, you’re the first person I’m calling.